A fire has broken out at a busy building supplies market just outside of Moscow to the north-west. Plumes of black smoke could be seen rising from the site, with around 55,000 square meters (592,000 square feet) of the premises reportedly ablaze. The popular Sindika market has been on fire since Sunday afternoon. Around 3,000 people have been evacuated from the site, emergency services reported. Three people were injured in the fire, having suffered from smoke inhalation. One had to be hospitalized. Witnesses reported hearing explosions, as TASS news agency, citing sources in emergency services, said several cars exploded in the market’s underground parking. The “entire parking lot is ablaze,” according to the source. В Москве пожар на рынке «Синдика». A large area to the north-west of Moscow has been covered in black smoke, with a number of residential complexes located nearby. When the fire broke out, customers fled the building in panic, according to eyewitnesses. 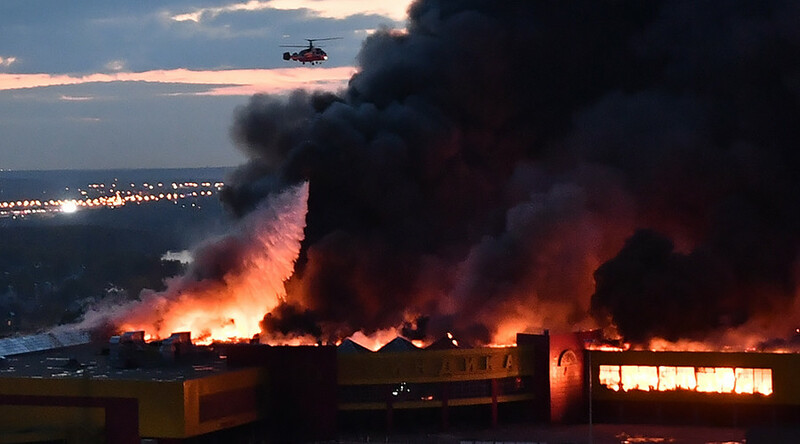 Three helicopters have been deployed to deal with the blaze, emergency services reported, adding that around 230 tons of water have been dropped by helicopters on the burning structures. The firefighters managed to contain the blaze by 11pm local time. It is not yet clear what caused the building to go up in flames. The investigation into the causes of the fire will be led by forensics experts from the Russian Emergencies Ministry. At least 400 square meters (4,305 feet) of the market building have collapsed, the local emergency services official told Ruptly. More than 1,200 shops are located on the premises of the construction market, which occupies around 130,000 square meters (32 acres). The estimated damage from the fire is some 5 billion rubles ($86 million).